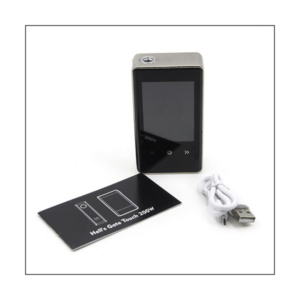 Doing research on the Hell’s Gate, a pleasant enough touchscreen box mod, I uncovered the perfect example of the Chinese Electronic Cigarette industry. After what I learned, I could have easily tossed the Hell’s Gate mod in the trash and be done with it, but after thinking about it some I decided to go ahead and write the review anyway. Hell’s Gate is not a bad mod, not at all, it’s the origin of it that makes me, as an American, kind of pissy about the whole thing. You see, there are two Hell’s Gate 200W TC Box Mods. They are identical in appearance and specs, right down to the icons used on the touchscreen. One is made by YEP Ecig Group, and one by Tesla ecigs. Now, Tesla is not the same Tesla that makes battery driven cars, although if you looked quickly at the logos of both Tesla’s you might think they were the same. Anyway, as far as I can tell, and forgive me if I’m wrong, Tesla and YEP are two distinct companies, one of which is responsible for the first Hell’s Gate, and the other is responsible for the counterfeit, or the ripped off Hell’s Gate. I honestly do not know which came first, Tesla or YEP. I do know that the Hell’s Gate I have in my hands is YEP’s Hell’s Gate, not Tesla’s. But I don’t think it matters anyway. 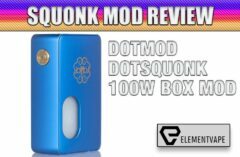 What follows is my unbiased review on the hardware, the actual box mod, with any feelings about the company or companies, and their soft “value system” left at the door. However, before I leave them at the door I have to say one thing; If I was not given this device to review I would not buy one. Not because it’s a bad mod or a poor value, quite the opposite really. I would never buy one because of the fact that either Tesla or YEP is a counterfeiter, and consumers need to trust the company they buy from, and if you can’t trust them, don’t patronize them with your hard earned money. I hate the crappy copyright laws in China, I really do. Now, on the other hand, IF Tesla and YEP are different divisions of the same company, or if one of the companies purchased a license to build an identical Hell’s Gate, then apologies to both companies, and to you, our readers, for putting up with this rant. When I saw my first touchscreen mod I thought it was kind of cool, and a good progression in the development of modern mods. I think my only complaint about the mod’s touchscreen was the lack of resolution, due, I think, because I’ve been looking at Retina Display screens for a few years now, from my iPhone and iPad, to my MacBook Pro. None of the touchscreen mods on the shelves today come close to retina quality, but, in truth, they aren’t that bad either. With the Hell’s Gate touchscreen by YEP, the images and text are very readable, and the reaction speed is quick. The OS is simple, yet thought out, and fairly easy to use. Definitely progress. Someday we just might have a retina display mod, in the meantime, what we do have is here now. The resolution of the YEP Hell’s Gate 200W TC mod is 360px by 240px. In the nutshell, the Hell’s Gate mod is a full Temp Control, touchscreen box mod that features a full-color 2.8 Inch TFT display in “thousands” of colors, which is fairly large for a box mod. It features mostly intuitive controls, but for many I’ve heard from in various forums, the fact that you have to LOCK IN the wattage/temp before using it is not obvious. Admittedly, even I didn’t know about that until I kept increasing the decreasing the wattage just by sliding my fingers across the screen. Below is a summation of its basic functions. Most importantly, when you set your wattage or temperature on the screen, you must lock it before using it to prevent accidental increases or decreases that can ruin your day with a single draw on the atomizer. I learned that the hard way, before reading the manual. Okay, so to operate the YEP Hell’s Gate, here are a few things worth knowing before you spend money on one. every setting is done through the touchscreen. The body has a rich matte rubberized finish and glass display. The only physical button is the large circular chrome button on the side of the device. The USB/Firmware port is also on the same side of the device as the firing button. To turn the Hell’s Gate on you click the fire button 5 times quickly. 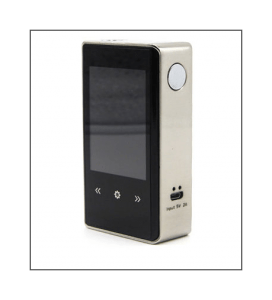 The large touchscreen will light up, and within a couple of seconds you’ll see its current settings, battery power in two battery icons, atomizer resistance in ohms, puff counter, voltage and amps. To enter the main screen, touch the Setting Wheel imprint directly under, and in the middle, of the touchscreen. There are 6 icons you can touch to get into the menu. From the top left, the icons are TC Mode, VW Mode, Puff Info, Background Switcher, Locking, and Help. These buttons are self-explanatory, but a couple of things are worth mentioning now. TC Mode – Touching this icon reveals 6 modes that you choose just by touching it. VTC-Ni200, VTF-Ni200, and the same for Titanium and Stainless Steel wire. Just click to choose. VTC is Variable Temperature Celsius and VTF is Variable Temperature Fahrenheit. VW Mode – Clicking on the VW Mode icon you’ll then see the current wattage. To adjust it, simply slide your finger in either direction to raise it or lower it. Locking – Choose this icon after choosing your other settings. You must lock your setting to prevent accidental changes. The Hell’s Gate 200W TC supports customizable background images that you can create on your computer and upload through the USB Port. 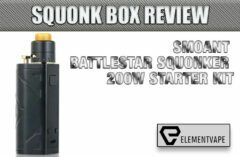 Powered by two 18650 high-amp batteries (sold separately), the device is fully capable of firing up to 200W with fully charged batteries. The minimum atomizer resistance is a wicked low 0.05ohms. A hi-tech temperature control suite features present support for Ni200 Nickel, Titanium, and Stainless Steel coils. Hell’s Gate seems to be a well-built device, with a nicer screen than I’ve seen in other touchscreen displays. The Hell’s Gate 200W TC is an excellent choice for any vaper looking to get into a box mod that offers a touchscreen interface. Although there probably isn’t any difference between the Hell’s Gate made by YEP or Tesla. Pick Up Hell’s Gate by YEP at Element Vape for $74.95.